The publisher, Sahara Reporters, Omoyele Sowore has said that President Muhammadu Buhari got sick when he saw how much had been looted from Nigeria and that there is no more corruption in Nigeria because there is nothing else to steal. Sowore in his presentation at the Tracking Faulty Towers workshop which held at the University of Kent, London according to thecalbeng report said: "There is no corruption in Nigeria anymore because there is nothing else to steal and loot," he said. "When Buhari saw how much has been looted, he became sick... We are happy that Nigeria is no longer among the ten top countries in the world." "Western countries accepting Nigeria and other countries stolen money should be the ones tagged corrupt," he said. "In my village, the custodian of stolen things is seen as the main criminal... People cannot steal in western countries because where to keep the stolen money is a challenge. "The Western world made their system very difficult to steal and loot money." 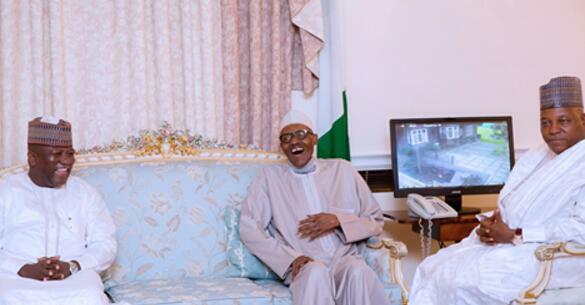 He also commended Buhari for putting in place strict measures to check corruption. "Transferring money from abroad to Nigeria has a limit and the charges are high but in Nigeria, we don't have such until Buhari came into power," he said. "We have the duty to challenge our leaders and the primitive accumulation of wealth Nigeria. "We need a serious re-orientation programme for the youth on the belief of quick wealth accumulation through corruption and crime. We need to let them know that the only way is through honest means and hard work." Also the executive secretary of the presidential advisory committee against corruption (PACAC), Bolaji Owanasoye admitted that Nigeria is improving in its fight against "the infamous tag". "I am very happy to read recently that Nigeria is not among the top ten corrupt countries in the world," Owanasoye said. "That is an improvement that shows something is being done right to fight corruption and crime in the country." "Nigeria whistleblowing policy is celebrated because of reward attached to it but if revoked tomorrow, citizens should still be devoted to report corruption and crimes," he said. "A pervasive and endemic culture of silence which allows corruption and sin to thrive is one of the challenges the Nigeria whistle blower policy face. "The culture of acquiescence which makes corruption appear legitimate is also a challenge we have in Nigeria. "Nigerians have both moral and legal duties to report crime and corruption as it enhances rule of law and peace of security of society. "The inability to improve rule of law and governance in a weak state reinforces underdevelopment and vice-versa. "When a state demonstrates the political will to hold wrongdoers accountable and creates a dependable disclosure frame work the citizens will see it as a duty to report crime and corruption without fear or prejudice."